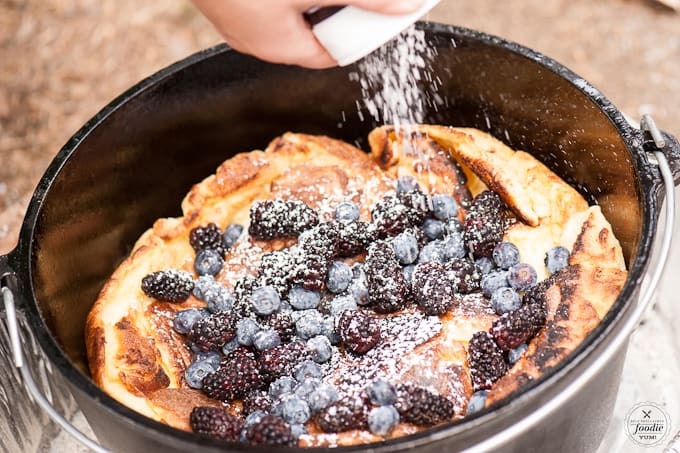 I love outdoor cooking, especially when I’m camping, and waking up to a Dutch Oven Dutch Baby smothered in sweet berries is such a treat for my family! I used to be so afraid of dutch oven cooking. It was so mysterious to me. 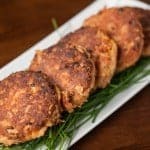 Cooking in a pot with no stove? Say what? I was so afraid of it that I borrowed a friend’s dutch oven for two years in a row until I finally got my own beautiful, American made, Lodge camping dutch oven. If you camp, you must own one of these. 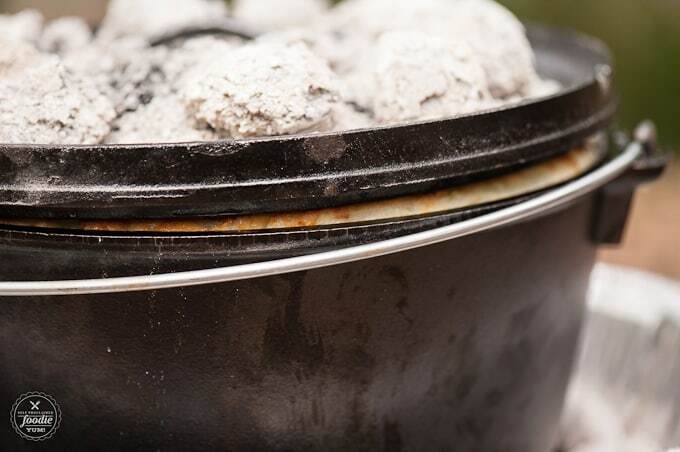 Dutch oven cooking is similar to canning, in my opinion. Do they really have anything to do with one another? No. But here are the similarities I found: 1. Both have been done for hundreds of years. 2. I stayed away from trying both either because they intimidated me. 3. Both are super easy once you get the hang of them. 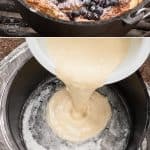 A Dutch baby, also known as a German pancake, is just a very egg-y pancake. I consider the taste and texture similar to a crepe. 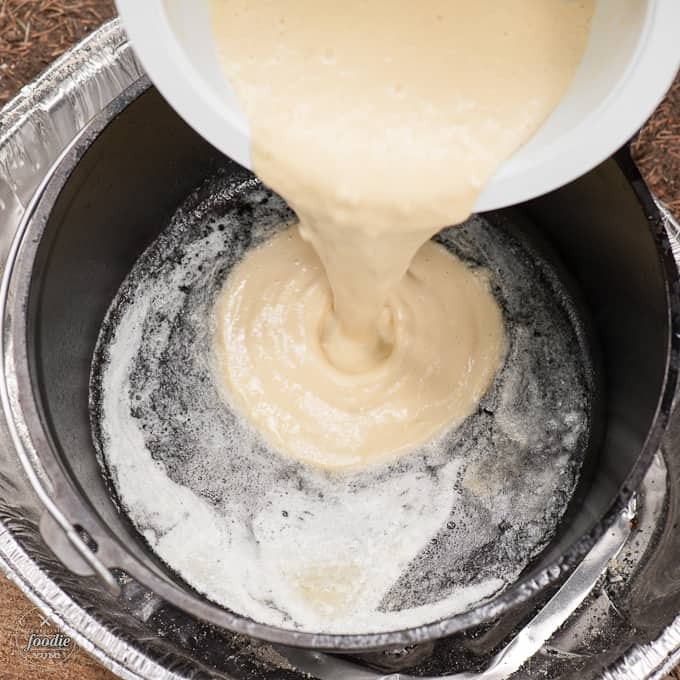 The recipe starts by melting an entire cube of butter in the hot pan – aw yeah – and then you pour the batter in and cover it all up with a piping hot lid. 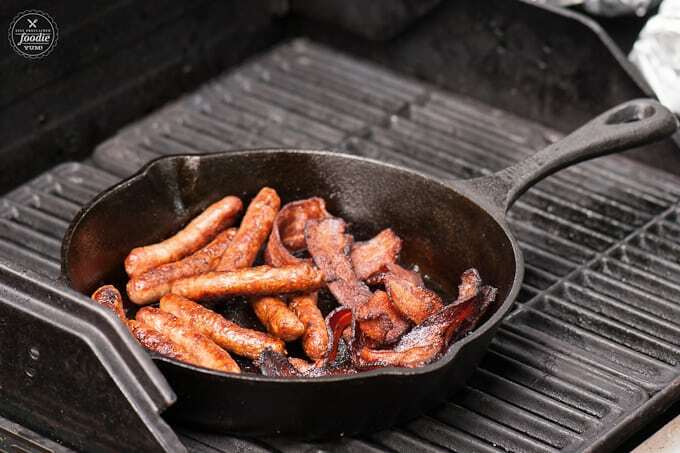 While its cooking, do yourself a favor and make all the other campers around you jealous by wafting the wonderful aroma of bacon and breakfast sausage in their direction. Those dutch oven lids are pretty darn heavy, and my super puffy pancake was actually strong enough to lift the lid right off the base! Of course, it sinks as soon as you take the lid away, but it was fun to watch at the time. You can cover this thing with syrup, but I much prefer fresh berries and some powdered sugar along with a squeeze of lemon. Slice it up into six good sized portions and watch them disappear! 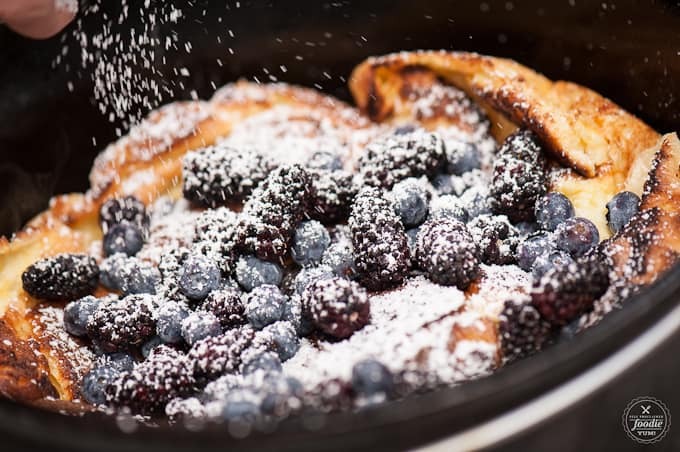 And because I’m absolutely smitten with food shots of sugar falling on top of fresh berries atop and piping hot dutch baby, I figured I’d give you one more close up to drool over. 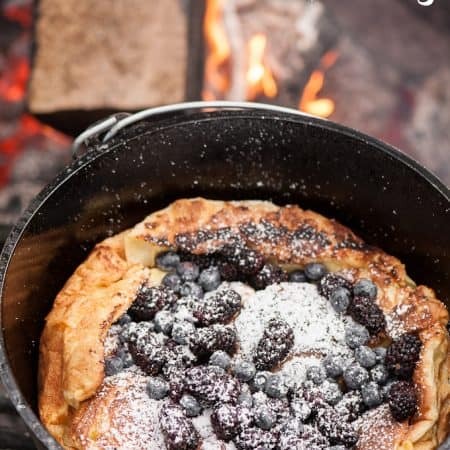 I love outdoor cooking, especially when I'm camping, and waking up to a Dutch Oven Dutch Baby smothered in sweet berries is such a treat for my family! Using a 12 inch (8 quart) dutch oven, prepare 24 charcoals. In a large bowl, combine the eggs, milk, vanilla, and lemon zest (this can be done ahead of time). 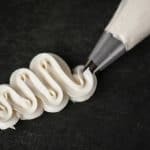 When you're ready to cook, add the flour and salt and whisk together until well blended. 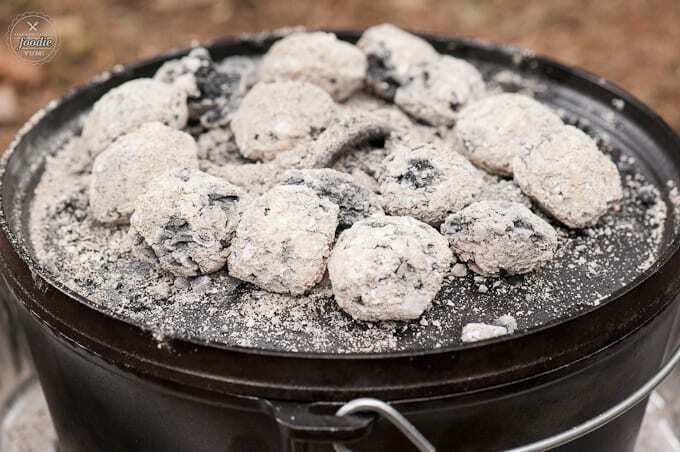 When the coals are nice and hot, place 8 coals directly under the dutch oven. 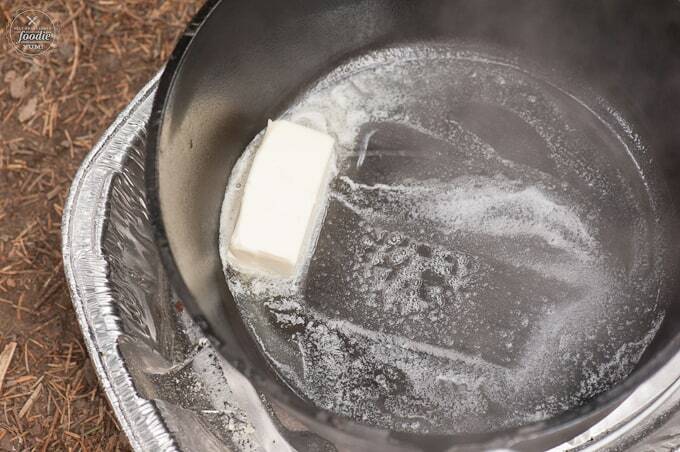 Add the cube of butter and allow to melt. Once melted, add the batter to the pot, cover, and add remaining 16 coals to the lid. Rotate the lid 1/4 turn every 5 minutes and allow the dutch baby to cook until set, about 25 minutes. It should puff up all the way to the lid and once the lid is removed it will fall. Remove from heat. 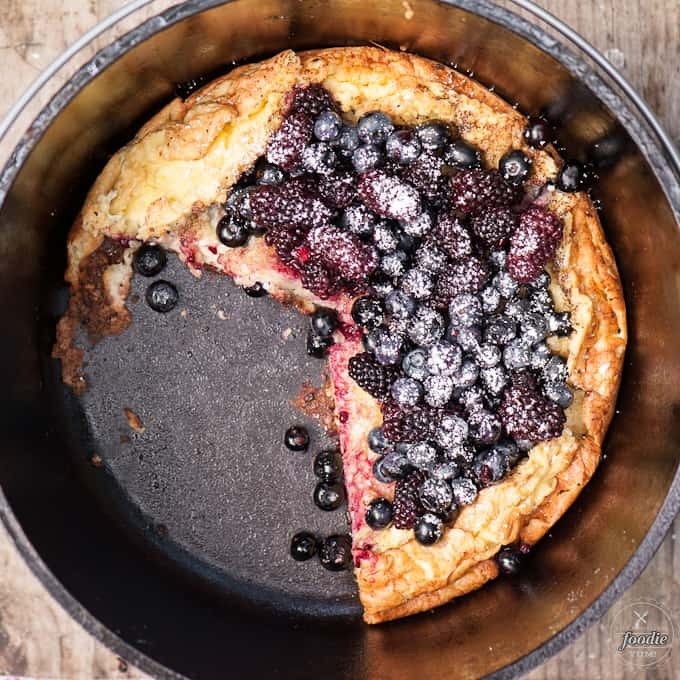 Cover with berries, powdered sugar, and a squeeze of lemon. Replace lid and allow the berries to warm before serving. 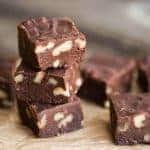 Cut into 6 slices and enjoy! 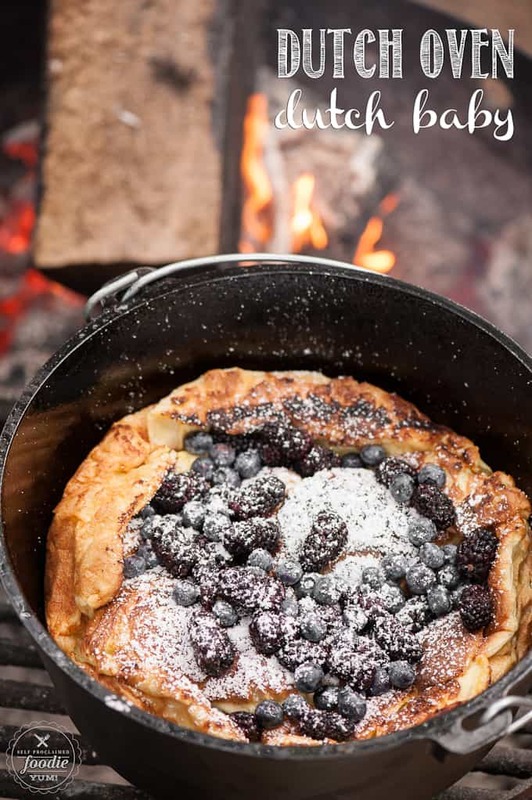 Ive never made a Dutch baby in my Dutch oven before. Great idea for camping! That was an amazing Dutch Baby. Made it camping and the family loved it! 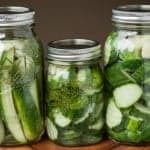 Can this be done in an oven with Dutch oven pot? If so what temp and how long? I would do 425 for 20-25 minutes.